Tom Beddoes (Brian Stirner) does not fight for glory or fantasies of heroism. The not-quite-21-year-old Englishman believes from the moment he is drafted that he will die fighting the Nazi menace; he writes as much in a letter to his parents. The opening shot of the film suggests the same thing to the audience, albeit in a somewhat hallucinatory manner. 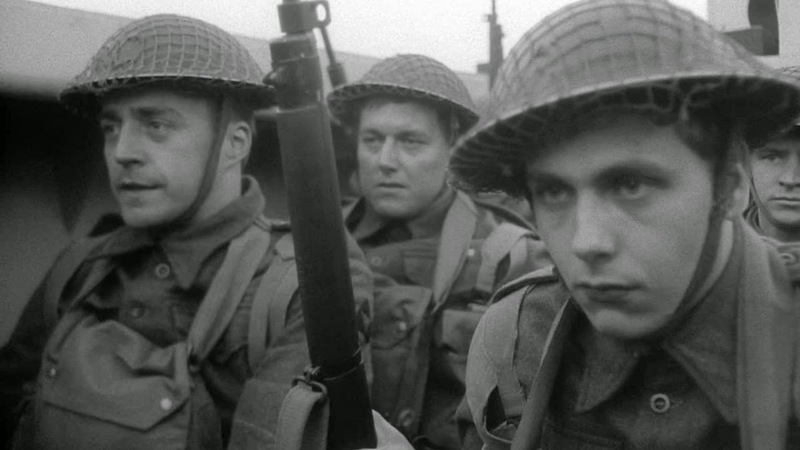 That path that “Overlord” (1975) traces from basic training to the storming of the beaches at Normandy is an inevitable one, rendering Tom's story both a tragedy and a tribute to the nobility of the soldier who stares fate square in the eyes and doesn't retreat. Tom's perspective is really that of a filmmaker and an audience looking back on monumental events now receding (though never diminishing) in the past. Producer James Quinn initially wanted to make a documentary about a new memorial intended to commemorate the thirtieth anniversary of D-Day. After Quinn recruited a young director named Stuart Cooper, who had developed a critical following with the short documentary “A Test of Violence” (1970) and his feature debut “Little Malcolm” (1974), the project began to transform. 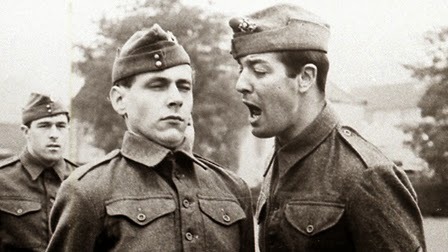 Cooper stuck with the initial idea to employ documentary wartime footage from the massive archives of Britain's venerable Imperial War Museum, but weaved a fictional narrative (which he co-scripted with Christopher Hudson) through the grainy shots of aerial bombardments and naval skirmishes. Some of the archival footage is breathtaking and eerily surreal; a giant water wheel propelled by dozens of sputtering rockets clatters across a rocky beach before toppling over, an alien contraption almost comically ill-suited to its environment. The layering of movie-style sounds of gunfire and explosions to the silent footage (some of which was taken from cameras mounted in bomb bays or on the guns of fighter planes) sometimes undercuts the awe-inspiring ferocity of the visuals, but that's a minor quibble. By contrast, the scripted sequences of Tom leaving home, going through boot camp, and biding his time before deployment are quiet and often serene, though flash forwards remind us of the freight train rapidly approaching. Brian Stirner portrays Tom as a gentle, thoughtful soul, clutching his copy of “David Copperfield” and shyly coming on to a pretty young woman (Julie Neesam) he meets during some rare down time. His philosophical bent proves to be a detriment when he has far too much time to think about what the future holds, but his less introspective peers are aware of their likely fate too; they simply don't articulate it the way Tom does. Cinematographer John Alcott (best known for his collaborations with Stanley Kubrick on “A Clockwork Orange,” “Barry Lyndon,” and “The Shining”) shoots in a style that perfectly complements the documentary-fiction hybrid. Many scenes with Tom hanging out with his fellow soldiers or saying goodbye to his parents feel like kitchen-sink naturalism, but the film sometimes abruptly veers into abstraction (slow-motion, slightly out-of-focus shots of soldiers running) or stops for a meticulously crafted painterly composition: a low-angle shot of Tom peering over a hill with thick white clouds drifting above him (both beautiful and completely unaware of him) is particularly memorable. “Overlord” won some festival awards at the time, but failed to pick up American distribution, largely disappearing until it was resuscitated and released about ten years ago. 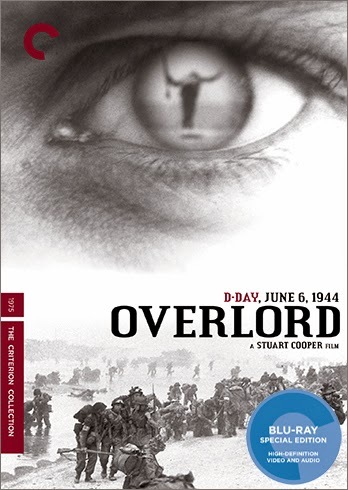 There are numerous British films about soldiers and citizens maintaining a stiff upper lip during wartime; “Overlord” may not be the very best (Powell and Pressburger are tough competition), but it is certainly one of the boldest and most innovative. You've never seen anything quite like it. Unless you've seen it, of course. And with this Blu-ray upgrade of Criterion's previous SD release, there's no reason for you not to. The film is presented in its original 1.66:1 aspect ratio. Since “Overlord” intercuts a great deal of documentary footage into its narrative material, the video quality can vary from source to source, but I can't imagine anyone being bothered by the slightly degraded or damaged image in some of the war shots. The image quality is consistently strong in the material photographed by John Alcott and this high-def transfer brings a lot of detail into sharp relief. Black-and-white contrast is meant to be soft and slightly gauzy in most scenes and the 1080p transfer preserves it all with a needed touch of subtlety. The linear Pcm Mono audio track sounds somewhat sparse, but that's by design. Dialogue is crisply mixed. Some of the war sound effects are mixed quite loudly, perhaps a bit too much so at times, but I'm sure that's also by design. Optional English subtitles support the English audio. The film is accompanied by a commentary track by director Stuart Cooper and lead actor Brian Stirner. Their commentaries were recorded separately. Cooper has much more information about the overall production of the film, but Stirner's unique perspective is enlightening as well. “Mining the Archive” (23 min.) is an interview with Roger Smither and Anne Fleming, film archivists at the Imperial War Museum. The Museum's archives play a major role in the film and they have plenty to say about the way archival footage was introduced and how much the Museum served as a research source for the movie. “Cameramen at War” (1943, 15 min.) is a documentary by the British Ministry of Information (credited as “Compiled by Len Lye”) which talks about the courage of the men who embedded with the troops to shoot film. D.W. Griffith is identified in one scene. “A Test of Violence” (1969, 14 min.) is Stuart Cooper's debut short film that won multiple festival awards. It is nominally about Spanish artist Juan Genovés, though it's a very abstract piece that recreates the violent scenes Genovés painted. The 28-page insert booklet includes an essay by critic Kent Jones, an excerpt from a presentation given by Imperial War Museum archivist Roger Smither, and excerpts from the novelization of “Overlord” written by Stuart Cooper and Christopher Hudson, co-screenwriter of the film. “Overlord” can feel a bit too portentous at times, but it is a sincerely moving portrait of a soldier bracing himself for the inevitable tragedy of wartime. Criterion hasn't added any new features from its 2007 SD release, but the high-def transfer is a strong one, as usual, and the original collection of extras was plenty good enough.